I've had this beer many times straight from the can, but this is my first instance of formally pouring it into a glass. Was it a mistake? The first thing that hit me was the pure, resinous aroma. Based on the dark orange/amber color, I didn't expect a fruit explosion, but nevertheless, the bitter hop smell was nice. After a couple of swigs of heavy resin, I knew I wasn't going to get much else. That isn't to say this the beer leaves a bad taste...far from it. I don't come across a lot of beers with such an emphasis on heavy, bitter hops that remain drinkable, but Oskar Blues has something good here with Dale's Pale Ale. It drinks more like an IPA than an APA, but it's not for me to argue. Drinking straight from the can yields a slightly different experience as I get more grapefruit on both the smell and taste. Perhaps the hop oils get left behind in the can if poured into a glass. In any case, I found both the can and glass to be enjoyable. Overall this is a smooth-drinking APA which finds regular rotation in my fridge. 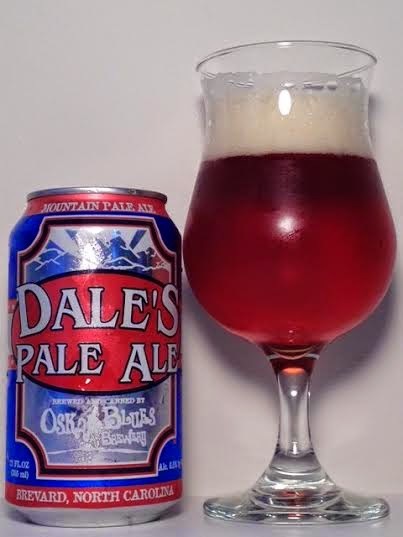 Dale's Pale Ale is just another example of great craft beer from a can.